Sarah finished Year 12 in November and agreed to discuss how she extended her use of this research process from her Year 10 studies across into her HSC studies. Twenty five P-6 staff members took part in a workshop after school in the IRC on using Guided Inquiry integrated with new technologies. They all worked their way through a unit on the Human Body using the Year 4 example from 2011. After spending 5 minutes on each step and armed with a booklet of theory and scaffolds they were, on the whole, quite excited to implement either aspects of this process or a full unit with Teacher Librarian support this year. The two Year 3 classes used Guided Inquiry in Term 2 to research the Human Body Science unit of work. The teachers decided to integrate across curricula and included all reading and writing into the process. This allowed time for the students to read widely on their chosen aspect, to learn how to compose and write questions and then write a final report. During this processs the children also learned a ot of information skills as shown in this short clip. 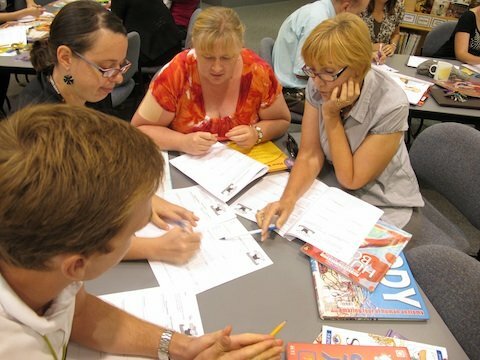 Information Skills through Guided Inquiry – Year 3 from Alinda Sheerman on Vimeo. We all met together in the IRC Theatrette for a presentation of the Vokis and invited the Head of Junior School and the Headmaster to the event. The children were extremely proud and excited by their achievement! The students investigated their selected “Issue in Australian Society”. Once again the class teacher and I were ‘blown away’ by their personal, enthusiastic and thorough research. This year we used Inquiry Circles to share ideas and give peer support throughout the Guided Inquiry process and the students enjoyed that immensely. Here are two of the presentations shared with the class and more will be posted here as they are processed into videos.